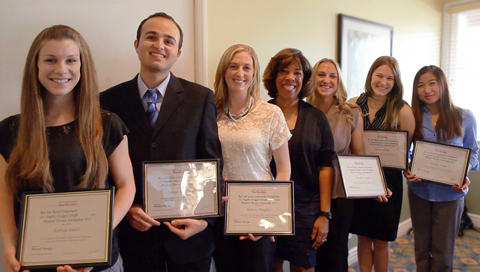 Campanella Foundation Scholarship recipients (from L-R): Karissa Smith, Samuel Rabizadeh, Rebecca Douglas, Breanna Langel, Janaya Pfeifer and Pamela Liang. Pictured in the center is Campanella Foundation’s Joni Campanella Roan. Photo by Krishna Narayanamurti. The Roy and Roxie Campanella Foundation has found great promise in the students of California State University, Northridge’s Department of Physical Therapy. The organization, begun by the late Los Angeles Dodgers great and his wife, provides financial assistance to students studying physical therapy around the nation. CSUN has been administering the Roy and Roxie Campanella Physical Therapy Scholarship Endowment since 2010. This year’s scholarship recipients are first- and second-year graduate physical therapy students whose leadership activities, evaluations and personal experiences (as well as an above-3.2 GPA) made them Roy and Roxie Campanella Foundation Scholarship winners. Since Douglass arrived on the CSUN campus, she’s been elected president of the Physical Therapy Club, where she been instrumental in developing events for the Department of Physical Therapy to help the campus and local communities. Douglass has also given presentations to the 2012 CSUN Pre-Health Conference and undergraduate CSUN kinesiology students. She has also attended multiple professional development conferences including those held by the California Physical Therapy Association and the National Physical Therapy Association. She calls the award an “honor” and noted how it will help her achieve her life goal — improving people’s physical and functional independence through physical therapy. “The Campanella scholarship represents and promotes that which is most important to me,” said second-year physical therapy graduate student Breanna Langel, “being an active member of a global community and providing exceptional care as a physical therapist.” Langel, a political science undergraduate, is a person who just wants to change the world. That’s why, as someone with such a global focus, receiving this award meant a great deal to her. In turn, she wants to ensure her promise of changing the world — one patient at a time. As part of her CSUN experience, Pamela Liang has discovered that learning about physical therapy is more than what is found in the classroom. As vice president of CSUN’s Physical Therapy Club, she has made outreach a part of her PT lifestyle. From organizing events to volunteering, she learned the value of what she can provide to her community. Liang even made her education international, using her Japanese-speaking skills to help the department work with visiting students from Japan. Upon receiving the award, Liang immediately called her mom, who was “so proud of me and couldn’t be happier,” she said. Janaya Pfeifer has always tried to have a positive impact in her community. She has been incredibly civic-minded, something she learned while in high school by joining various community service groups and projects. Now as her class treasurer and new Campanella award recipient, she can focus solely on her work. There are times when one’s education and personal lives begin to mesh together. When Samuel Rabizadeh’s uncle had a stroke, he knew he had to use the knowledge he gained by studying in CSUN’s Doctorate in Physical Therapy program. Rabizadeh even had experience working with persons with disabilities because of volunteer opportunities he had before. He used his experience, time and persistence to help his uncle recover and knows that his studies have been worth it. Receiving the Campanella scholarship allows him to continue that path toward making it in the world of physical therapy. Sometimes, to learn how the body reacts to movement, you have to be a specialist in moving. That’s one of the ways Karissa Smith did it, studying dance in the Department of Kinesiology as an undergraduate at CSUN. She’s taking that knowledge and applying it to her graduate studies. Smith has also volunteered at CSUN’s Pre-Health Conference and assisted a group of Japanese physical therapy students who visited campus. As for the scholarship, Smith is grateful for the accolade and understands that it will help her grow as a physical therapist.